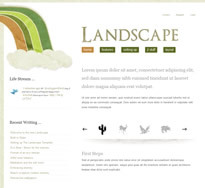 JoomlaBamboo have released Landscape, a grid based theme for Joomla with a nice left aligned layout instead of the usual centred layout you get with most Joomla themes these days and quite a lot of theme options and styling provided. Now only do you have the usual, but you've got fifteen rainbow variations, ten tree variations and twenty-four menu colour variations. Miz all of these up and it the chances of someone else having the same theme as you have is very slim, although the source files are also provided if you wanted to have a little more fun.